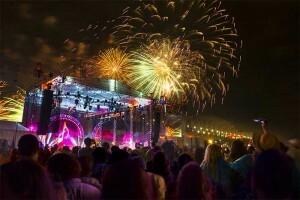 Bandit Lites recently wrapped another successful event with Music City’s Fourth of July Celebration. Striking Matches kicked off the concert, followed by Grammy Award-winning blues musician Keb’Mo’. Country super group, The Band Perry, took the stage before more than 26,000 firework shells erupted over the Nashville skyline, making the event the largest firework show in the South to date. In creating the design, lighting designer Chris Lisle played off the look of the bridges directly behind and adjacent to the outdoor stage. The new GLP X4S fixtures lined the main arch upstage center and two half arches on either side, while the downstage portion of the rig included three more horizontal arches to create a cohesive design. Bandit worked with Lisle to provide the striking light show, all the while keeping in mind the logistics of weather, space, distance and security. Lisle thoughtfully chose a variety of fixtures to each serve a specific purpose in the design. Small LED movers on the arches acted as eye candy and effect, VL3000 spots provided backlight on the band, while MAC 2000 Washes were the front light. John Lucksinger directed the lighting, while Dave Butzler acted as crew chief for the event. Additional crew included Cody Cheathem, Josh Fenn, Sarah Eucker and Keith Buechele. Photo: Nashville Convention & Visitors Corp.